Class: Freshman Hometown: Grove City, Pa.
NOTES: One-year letterwinner ... 2015: Competed in all seven meets during freshman campaign ... Regular member of Wolverine top-five ... Hampered by injuries late in year ... Season-best 26:55.7 at Gettysburg Inivite ... Finished 30th at the PAC Championships in 29:08.0 ... 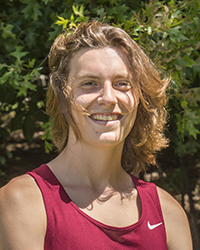 Recorded a time of 28:51.1 to finish 208th at NCAA Mideast Regional.